What is the Difference Between VCI Shrink and VCI Stretch Wrap? Often people interchange the product names VCI Shrink Film and VCI Stretch Wrap, but they are two distinct packaging films. They are both Volatile Corrosion Inhibitor (VCI) protection infused films, but their mechanical properties are different. 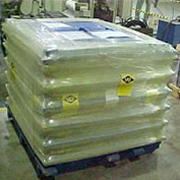 VCI stretch film is used to tightly bundle items such as pallets. It is like cling wrap and is tacky and adheres to itself. It is water resistant but is not the best choice for sealing out water. It is made in relatively thin mils and usually applied in multiple layers to create a secure slightly springy package. It comes on rolls designed to fit on stretch wrap palletizing machines and is also available in smaller hand rolls for convenience for smaller packages. 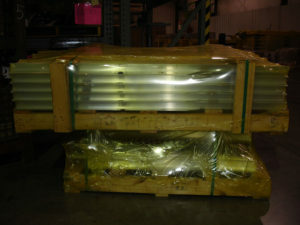 VCI stretch wrap is ideal for protecting open crates or layered pallets of parts. Parts that are difficult to box or do not need to be crated because of their shape, such as wire coil and deep drawn parts, are often directly stretch wrapped. VCI stretch film is an excellent way to secure and protect items as well as secure them to other packaging such as pallets or cores. VCI shrink wrap is a packaging film that has properties that cause it to contract and conform to objects when heat is applied. Special heat shrink guns, shrink tape are available for this task. Shrink tunnel equipment designed to work with high-volume conveyor lines also are an option. A shrink packed item has a taunt exterior that sheds water and other elements. The film is available in many gauges depending on the application, even films suitable for outdoor protection are available. VCI shrink film encapsulates items in a protective barrier and diffuses VCI into the package. VCI shrink film and VCI stretch film can also have additives such as UV (Ultra Violet), ESD (Electro-Static Discharge) and high-strength blends incorporated as options. These corrosion prevention films work to diffuser Vapor Corrosion Inhibitors (VCI) into the packaging that protects for years when properly applied. Large packages should have additional VCI Diffusers inserted into the center of packages to ensure the VCI protection reaches all parts of the package. Contact Zerust today for more information on the correct VCI packaging product for your application.